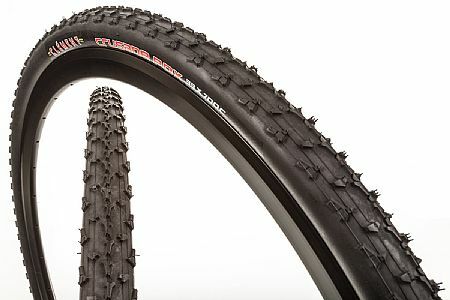 Very nice tires for cyclocross. I see lots of guys with these same ones. These are the first knobby tires I've owned for a 700c bike. I love them! They've been through about 30 miles of rough gravel and 5 cyclocross races and they still seem to have a bunch of tread left. The pricing at biketiresdirect is great. You won't find them cheaper elsewhere. I wasn't surprised to see the majority of guys at cyclocross races rocking these exact tires. You won't be disappointed. Supple, reasonably light, and with excellent traction. These are a great all-around choice for CX racing. Even though it is described as a mud tire, this one has become my favorite all-around cross choice. Traction is great on grass, and they roll well on every surface I've taken them over. I've run them at 25-40 psi and had no flats to date. Soft, grippy and fast under all conditions. Excellent grip in mud and all-round, very supple casing & round shape. Beautiful tire. Excellent all around tire which excels in the mud. Very supple rubber that yields round tire profile. Beautiful. These work great as CX mud tires. They're wonderfully grippy in sloppy conditions. Confidence inspiring. The sale price at BikeTiresDirect was also outstanding. I ran these tires front and back last season, and they did great in almost any condition. This included loose hardpack (very good), grass (great), soupy mud (great), hardpack snow (very good), peanut butter mud (okay, but I'm not sure what would have been better), and powder snow (same). As mentioned below, the rubber is soft, so don't use them for training. Racing only, it's looking like one season rear and two seasons front. 22 of 22 customers found this review helpful. I have been running a 70034 front and 70033 rear for the Cross Crusade race series. They do their namesake proud! I am using tubless-specific rims and running the tires tubeless with moderate pressures - between 32 and 40 psi depending on course conditions. I have had good to great performance in all the races I've used them in with the exception of one very slick day when I ran 40 psi in both tires. Too much bouncing and only fair traction. With just a little lower pressure, the tires perform exceptionally. I was previously racing on Challenge Griffo's with latex tubes and the tubeless setup wtih the Clements is definately an improvement, especially in really muddy conditions. The tires seem to clear mud very well. The tread pattern has good, predictible traction and seems to be relatively soft, aiding traction on the variety of surfaces typically encountered in racing (grass, mud, dusty dirt, asphalt, etc). Because of the softer compound, my guess is that these will be a single race-season tire if I use them for a significant amount of training rides as well as races. Lastly, I would credit my Stan's rims with the great tubeless performance I've had. Other rim designs might not work as well for running these tires tubeless.